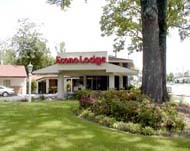 The Econo Lodge Intown is located just 2 miles from the Wilmington International Airport and the University of North Carolina at Wilmington. In every room there is cable TV, on-demand movies, refrigerator, coffee/tea maker, telephone, and a kitchenette. This single story hotel features a swimming pool, self-parking and wheel chair accessibility. There is free high speed internet access throughout the hotel. Popular attractions include Wrightsville beach, only six miles away and a variety of museums, galleries, historical sites, golf courses and restaurants nearby.